With a capacitive touch keypad and one of the largest LCD readouts in the industry, the Eclipse combines innovation and precision to illuminate labs worldwide. AE Adam, the German subsidiary of Adam Equipment, a leading provider of balances worldwide, will be exhibiting a selection of lab balances and scales at Hall B1, Stand 226 during Analytica Munich from 10-13 May 2016 at the Messe München in Munich, Germany. In the spotlight will be the Eclipse, Adam Equipment’s newest series of precision and analytical balances. Combining innovation and brilliant precision, Eclipse balances feature a capacitive touch keypad, one of the largest LCD readouts in the industry, and both USB and RS-232 connections. Models are available with readabilities from 0.1mg to 0.1g. Eclipse comes in three different body styles, all with solid metal construction that provides the durability to withstand chemicals and rigorous daily use. The compact footprint of precision and analytical models allows the balance to occupy minimal space on the laboratory bench, while offering an extensive array of features. The large-pan Eclipse models offer external calibration, with the same functionality as smaller-pan models. To learn more about Eclipse analytical balances, click here. To learn more about Eclipse precision balances, click here. Nimbus balances will also be on display at the Adam Equipment stand. Nimbus provides a streamlined weighing experience for lab professionals worldwide. Adam has participated in Analytica for nearly 20 years, and Adam representatives will be on hand during Analytica 2016 to meet with participants, to demonstrate a selection of lab balances and answer questions about any of Adam's products. In its 25th year, Analytica is regarded as the leading international fair for state-of-the-art laboratory technology and pioneering biotechnology. The event attracts more than 1,200 exhibitors from 40 countries. Nearly 35,000 visitors will travel from 116 countries to attend Analytica, which occupies more than 55,000 square meters of space at the Messe München/Munich Trade Fair Centre. 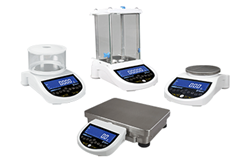 For more than 40 years, Adam Equipment has designed and manufactured precision balances and scales for professionals worldwide in the laboratory, medical, education, industrial, food, animal/veterinary and jewellery markets. Adam is committed to offering an extensive selection of weighing equipment with best-in-class value. Headquartered in the United Kingdom, the company has strategically established offices in the United States, South Africa, Australia, China and Germany to provide product support and speedy delivery to distributors. For more information about the company and its products, go to http://www.aeadam.de.